Sören Auer studied Mathematics and Computer Science in Dresden, Hagen and Yekaterinburg (Russia). In 2006 he obtained his doctorate in Computer Science from Universität Leipzig. From 2006-2008 he worked with the database research group at the University of Pennsylvania, USA. In 2008 he founded AKSW research group at University of Leipzig, which he led till 2013. Currently, he holds the chair for Enterprise Information Systems at University of Bonn and leads a department at Fraunhofer Institute for Analysis and Information Systems (IAIS). Sören's research interests include semantic web technologies, knowledge engineering, software engineering, usability, as well as databases and information systems. He led / is leading several large-scale collaborative research projects such as the European Union’s FP7-ICT flagship project LOD2 comprising 15 partners from 11 countries. Sören is co-founder of several high-impact research and community projects such as the Wikipedia semantification project DBpedia, the OpenCourseWare authoring platform SlideWiki.org (received the OpenCourseware Innovation award) and the spatial data integration platform LinkedGeoData. Dario is a social computing researcher and open knowledge advocate based in San Francisco. He is currently the Director of Research at the Wikimedia Foundation, the non-profit organization that operates Wikipedia and its sister projects. His research spans the behavioral and social aspects of online collaboration and commons-based peer production. As a co-author of the Altmetrics Manifesto and a long-standing open access advocate, he is interested in the design of open systems to promote, track and measure the impact, reuse and discoverability of research objects. 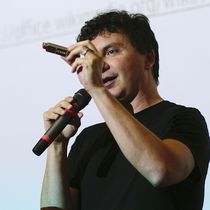 Prior to joining the Wikimedia Foundation, he held research and teaching positions at University College London, University of Surrey, Sciences Po, Paris Diderot University, and École Normale Supérieure. He holds a PhD and MSc in Cognitive Science from the École des Hautes Études en Sciences Sociales in Paris, a MA in Philosophy of Science from the University of Pisa, and a licenza from the Scuola Normale Superiore in Pisa. He is the joint recipient of a gold prize in Interactive Visualization from the Information is Beautiful Awards. His work has been featured in various outlets including TechCrunch, the Guardian, the Wall Street Journal, BoingBoing, the Chronicle of Higher Education, The Next Web, and Times Higher Education.